Kris Kristofferson and Mickey Newbury: A Texas Connection. I remember the first time I heard Kris Kristofferson sing. It was in San Francisco, early 1970s, my husband Richard, son Richie and I were visiting my brother, Tom McEvoy and his soon-to-be wife Joanie, in his apartment on California Street a couple of blocks above Fillmore Street. It was a colorful "happening" area. "I want you to hear this," Tom said placing an LP on the stereo. Chit chat stopped as we settled back listening to this guy named Kristofferson singing his own songs: Help Me Make It Through The Night, Casey's Last Ride, Sunday Morning Coming Down, Darby's Castle, Me And Bobby McGee, For The Good Times. Radio had been playing stellar versions of some of these songs by artists such as Sammi Smith, Ray Price, Roger Miller and Ray Stevens. Kristofferson's rough as tree bark voice was nothing like Price's smooth tone or Smith's sultry delivery. Yet there was something immensely compelling about his straight from the heart honesty that slammed into San Francisco sophisticates and this Texas country girl, with equal force. We all sat mesmerized, staring at the floor and sipping drinks, feeling the stories we were hearing: the emptiness in Casey's life, the sorrow in the ruins of Darby's Castle, and the loneliness of a Sunday morning sidewalk. My brother Tom was tending bar at Harpoon Louie's, a busy downtown club that has long since faded from the scene. Loud music and the din of voices from elbow to elbow crowds of the beautiful and upwardly mobile were a natural part of his work day. 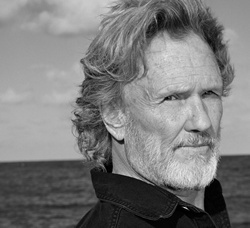 The simplicity in Kristofferson's songs made a bridge to quiet time after the sensory overload. Thirty five years later the songs are still here, having made the journey from vinyl to 8 Track to CD. Kristofferson has grown into an entertainment icon of gigantic proportions, and my brother and I have traveled more roads than we ever imagined, but those songs continue to get cued up in my CD player occasionally. In this increasingly noisy world, they are still a bridge to quiet time. We knew nothing about Kristofferson then. We would come to learn that his life was far more interesting than any song he could ever write. Perhaps that's why he had to write them. His story is well known, born in Brownsville, Texas, son of an Air Force General, family moved to California, attended Pomona College, apparently excelling in everything he attempted. He lettered in football, was a Golden Gloves boxer, Phi Beta Kappa, won awards from Atlantic Monthly for creative writing, a Rhodes Scholarship took him to Oxford University in England to study literature. Military life, a family tradition, was always hovering in the wings and he joined the army after Oxford, served as an Airborne Ranger helicopter pilot, attaining the rank of Captain, got married, started a family, and was offered a position teaching English Literature at West Point. It was a story book life�well planned, well executed with all the makings of a, they all lived happily ever after, ending. Except, of course, they didn't all live happily ever after. At least not right away. Kristofferson took a 180 degree turn and moved to the country music capitol Nashville, Tennessee to begin at the bottom in an industry that is seldom kind to newcomers. Looking backward, it's easy enough to see he had too much talent not to explore it. But it was a tremendous step down from the prestige of West Point to a janitor's job at Columbia Records on Music Row, although it was not as crazy an idea as it might have seemed. It put him in contact with music people and he would actually get some of them to listen to his songs�eventually. With his skill as a helicopter pilot he also earned money flying workers to and from off-shore oil rigs, so he was not quite as down and out as some biographies have painted him. Still it was a trying time personally and professionally. It must have taken a lot of courage to do that, I commented in a phone interview with Kristofferson many years later. "It was a matter of survival, not courage," he said. "And it was the most selfish thing I could have ever done. A lot of other people, my wife and kids, had to pay for it. But I would be dead if I had not done it." "I feel really fortunate that that has all worked out well, the relationships I mean. My kids all love each other and I'm on speaking terms with all my ex-wives," he added. He said two of his heroes before he came to Nashville were Willie Nelson and Johnny Cash. He would meet and become life-long friends with both, as well as Waylon Jennings. They would record and tour as The Highwaymen and make movies together. It was Cash, he says, who introduced him at the Newport Folk Festival and encouraged him to begin performing.